Orange and brown, our colors proud, we'll raise them, let them fly. We're the Astros, cheer the Astros, Astros of Shepard High. 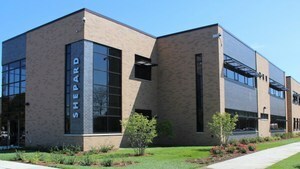 Fight, fight for Shepard High, then you'll lead all the rest. Fight, fight, fight with all your might, you'll win this game. The S! the S! The SHS! We are! We are the best! Who are? We are! The SHS! ASTROS!! !